Blancpain combines tradition with cutting-edge technology. They produce a diverse range of luxury watches for the discerning collector. Popular Blancpain collections include Le Brassus, Léman, L-evolution and Villeret. 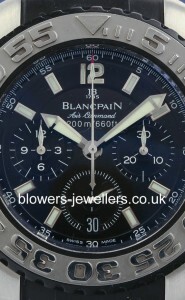 But out of all Blancpain timepieces, one collection that stands out most is the iconic Fifty Fathoms diver’s watch. 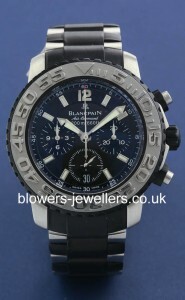 Browse Blowers’ selection of pre-owned Blancpain watches below. All our watches come with a one-year guarantee. You can view any watch on our website at our Kingston upon Hull boutique, or by appointment at our London office in Mayfair. Looking for a particular model? Get in touch and we will endeavour to source it for you.